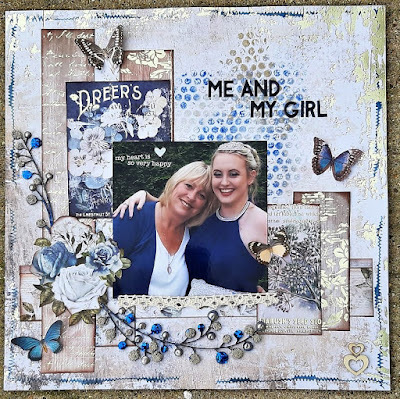 Anita here with you today and I have a new layout to share, this time using the Loves Me range from Pebbles. 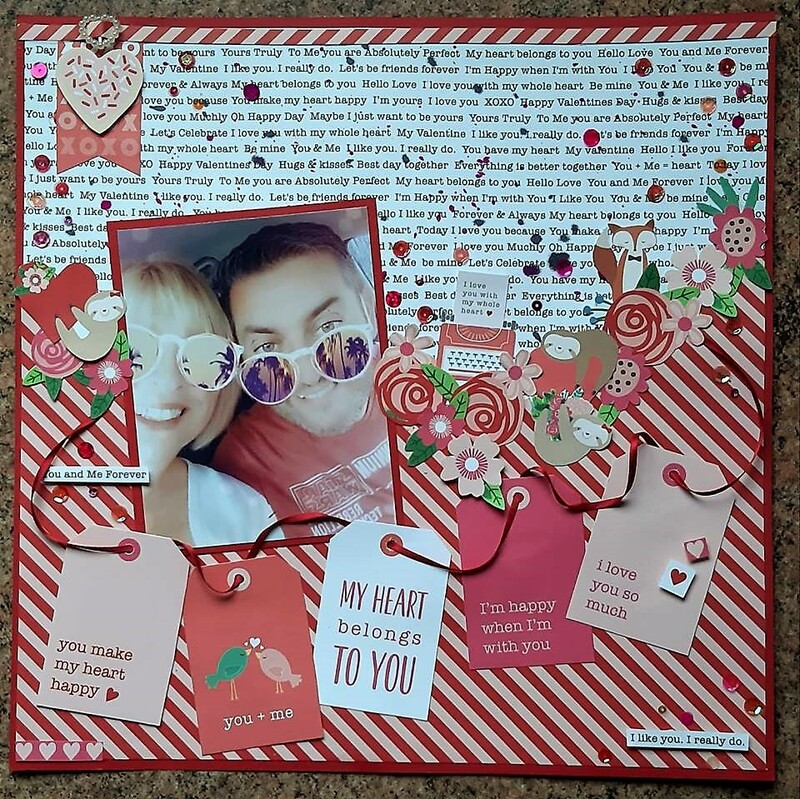 Double sided papers filled with striking patterns, hearts, cute animals, flowers and tags all in a range of eye catching pinks and reds. It will melt your heart! I backed the layout on a sheet of Marischino cardstock and matted the photo with the same colour. 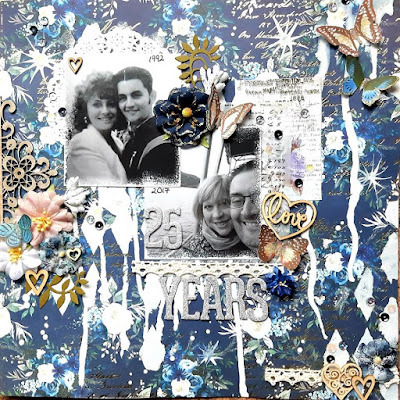 I used a sheet of Huggably Yours and also Bouquet of Love, torn at angles and over lapped to make back up to an 11.5" x 11.5" square. On the upper half of the page I splattered some drops of pink and black Distress Stain and cut a thin strip of the striped paper that I then added a pearly buckle to and stuck across the top of the page. 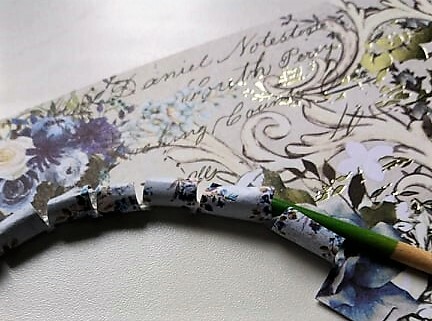 From the left over pieces of the 2 sheets I cut various flowers and sloths on hearts which were placed along the torn edges to create a border. From the sheet of Tag You're It I chose 5 tags that I liked with various sayings on and threaded them through with some 3mm Satin Ribbon, then arranged them across the page. This is the perfect paper collection for up and coming Valentines Day, whether it be for a love filled layout or making that special someone an extra special card....but also for lots of other themes too, why restrict yourself! You can see all the Pebbles Collections in the SHOP along with lots of other needful things. Here is another layout using Georgia Blues Collection from Prima. 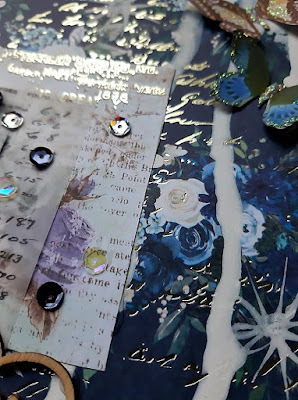 These papers are an absolute pleasure to create with and I am rather sad that I am at the end of my stash of them ( I think I shall have to be putting in a order for some just to squirrel away and keep just to stroke and admire!!) I had one whole sheet left in my DT kit and some scraps from other sheets left over and I knew they were just right for this photo of my youngest daughter and I on her prom night. 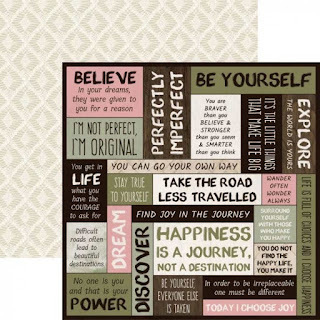 I based the layout on a sheet of The Watermark and used the reverse side, that has gentle filing around the edges. Using one of the stitches stamps from the 49 and Market Gabi's Line Stitch set I dabbed it with a Distress Stain in Blueprint Sketch and stamped around the edges of the page from each corner. I also used some bubble wrap that I removed from the centre of a jiffy bag ( it was tiny bubbles and just perfect!) 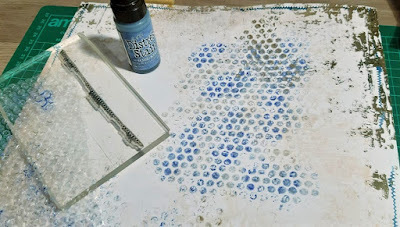 and chose 3 colours of acrylic paint, Cobalt Blue, Platinum and Silver. 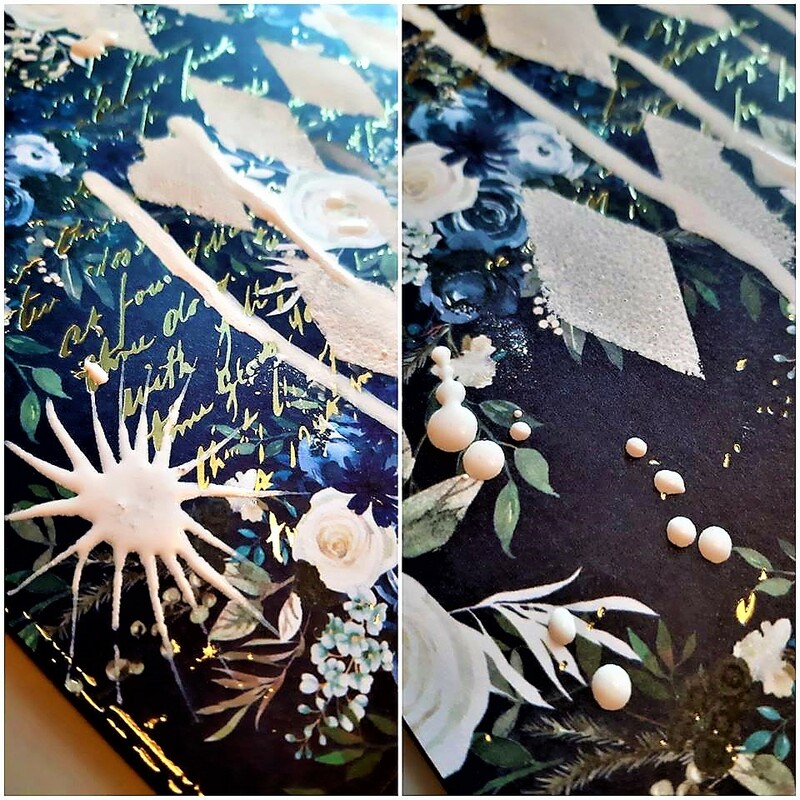 These were gently sponged onto the bubbles and then laid onto the page, pressing gently so as not to pop the bubbles. I took some Dusty Chipboard from my own stash ( there is a great selection of various chipboard embellishents in the shop) and gave it a watercolour brushover with some blue paint and then added Silver Beadazzles, Blue Glitter and Silvery Liquid Pearls onto the berries. I used up left over strips and panels from the sheets of Memory Lane and Written Chapters which were gently inked around the edges using an old brown inkpad. These strips were then layered up across the page before adding the photo which was printed in a 5 x 5 format. I used Pink Fresh Studio Puffy alphabet stickers for my Title in black. These are available in a variety of colours in the shop. 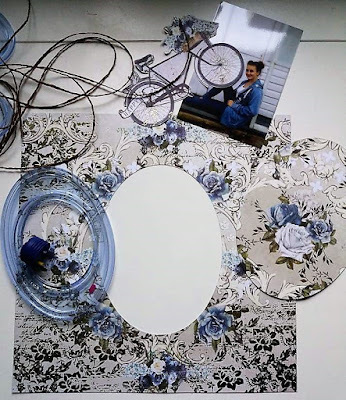 I added a piece of cotton lace below the photograph. 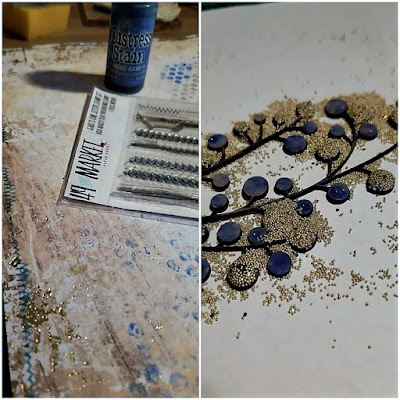 And then added the chipboard spray when the glue and Liquid Pearls had dried. 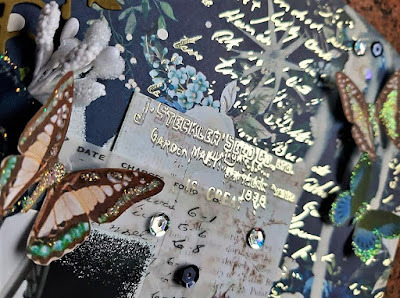 I also printed out some butterflies, which I fussy cut and added in various paces on the layout to finish it off. So that's it....I am all out of delicious Georgia Blues papers now....gutted! 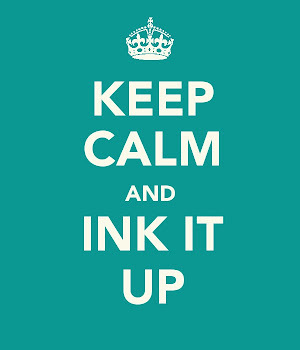 At least its a good excuse to pop over to the SHOP and do a little retail therapy isn't it??? Here is a recent page I made for my DT post over at Papermaze. Its using Prima's Georgia Blues papers. 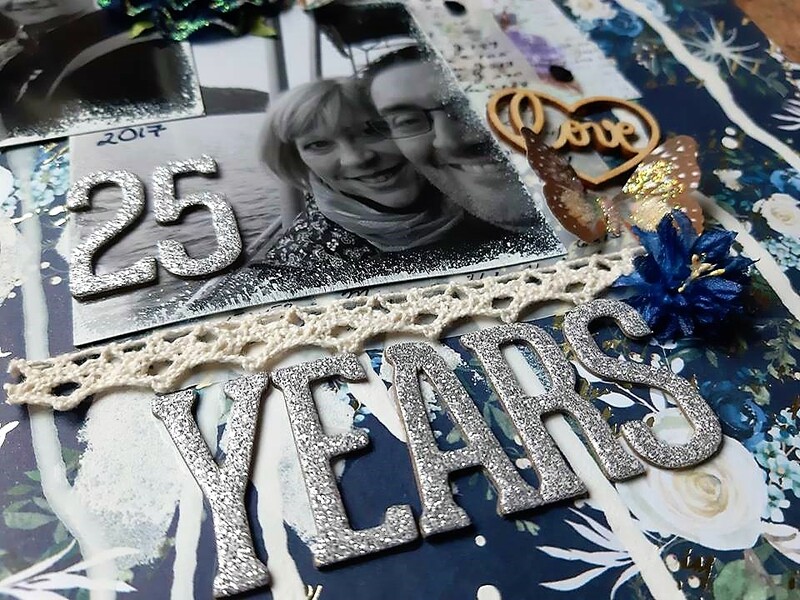 I wanted to add another layout to our Silver Wedding Album and thought this range would be just perfect for it. The top photo was taken the year we were married and the bottom one whilst on our Silver Anniversary Road Trip.....this photo was on a steamer at Ullswater. I used a sheet of Midnight Blues for my layout, the deep navy blue with the mix of white and blue roses and silver foiled fine script is really striking. 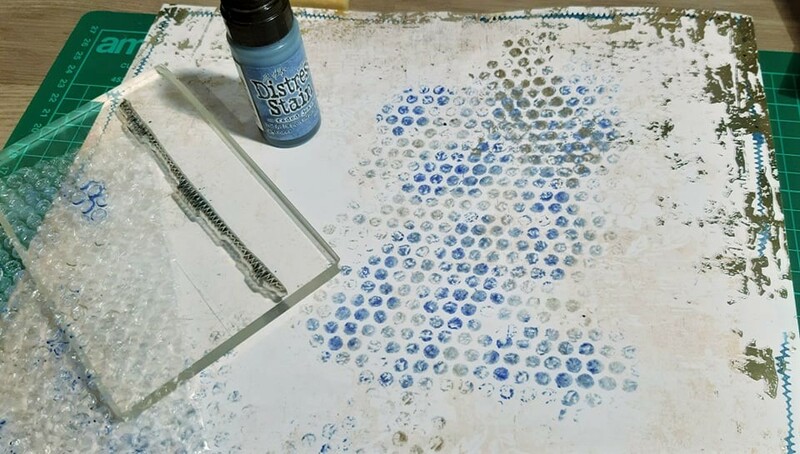 White acrylic paint was used and sponged through a diamond stencil, it was also drizzled and splattered across the page. On a couple of the large drops of paint I used a cocktail stick and dragged out points making it look star like. I also gently sponged some paint around the photo edges, instead of matting them. I added some Prima Emerson flowers with a mix of other flowers and die cut leaves from my stash and a chipboard embellishment from Dusty Attic. 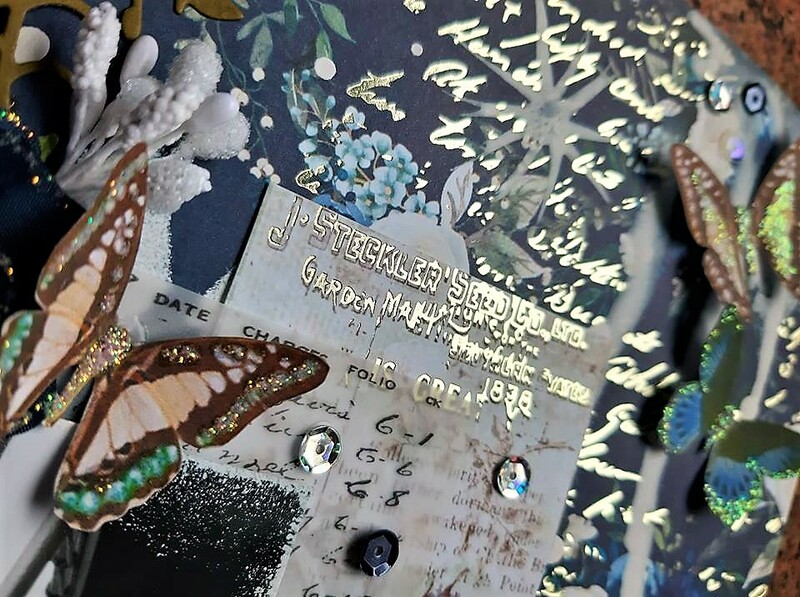 I have quite a few butterfly files on my laptop and thought I would like to add some to my page, so printed them out onto white card, fussy cut and Stickled them , raising their wings on small foam pads. 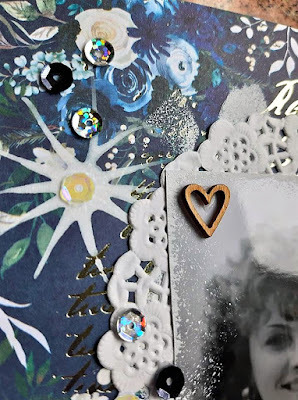 I also added a small doily behind the top photo , the printed vellum packaging from some Prima flowers and a panel cut from a sheet of Memory Lane behind the other photo. Also a sprinkling of sequins, small wooden hearts and a couple of lengths of cream cotton lace. I completed the page by making a title using some silver glittered chipboard letters. Hi There and Happy New Year Everybody!! It's Anita here today and I have been using some lovely Authentique *Jingle* papers to prettify a red lantern that I have had for a couple of years. I don't know if you are like me or not, but I just cannot resist a good bargain when I see one! 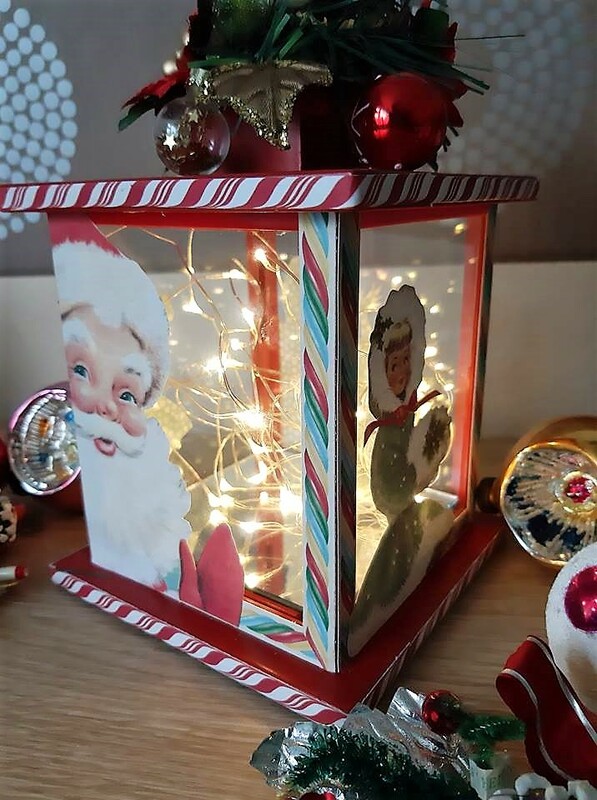 A couple of years ago, straight after Christmas, I saw some red lanterns, filled with tiny little lights and reduced by 70%! Not one who can leave bargains on the shelf I quickly purchased 2 and bought them home and packed them away for the following Christmas! 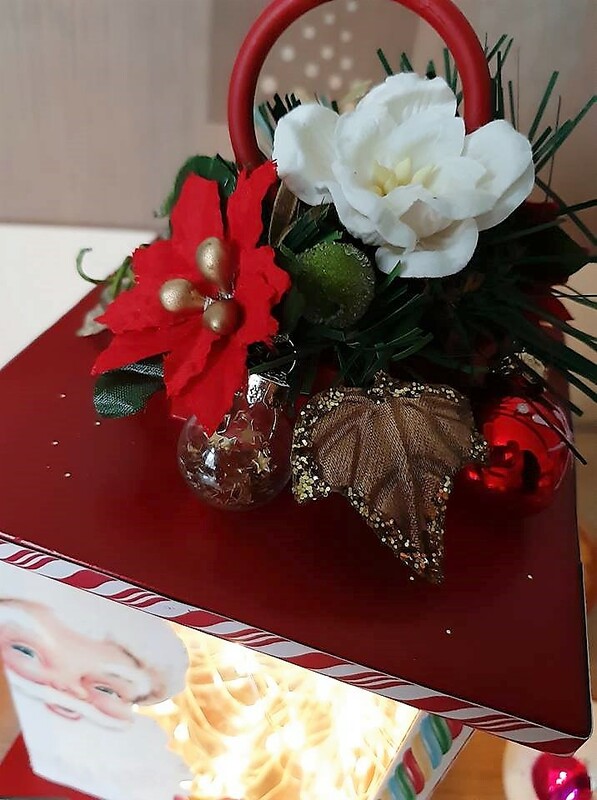 So then out they came for Christmas 2017 and they sat on the sideboard, sparkling away.....but actually looking quite plain. So this Christmas they came out again.....only this time they cried out for a make over! 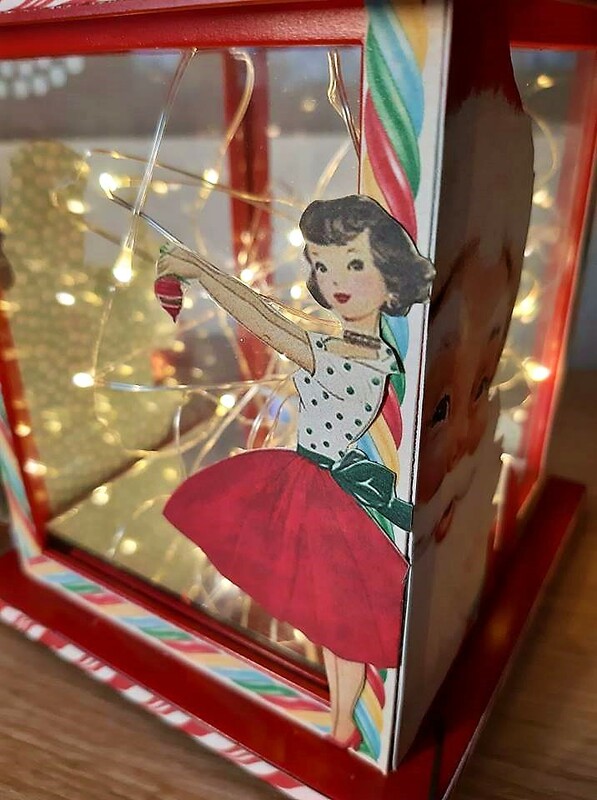 I saw some of the gorgeous Christmas papers in the shop and noticed 2 lovely new collections from Authentique. 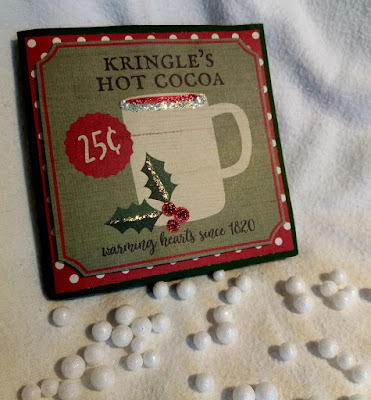 They were both really nice but in the end I chose to use the Jingle papers. 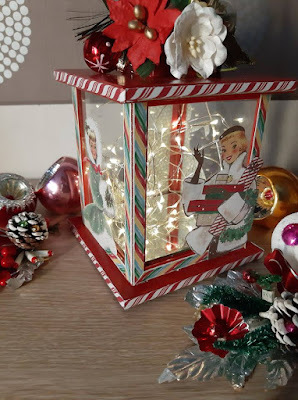 I cut some of the multi coloured candy stripes from the sheet of Retro Holiday Candies and used them to frame each side of the actual lantern part. 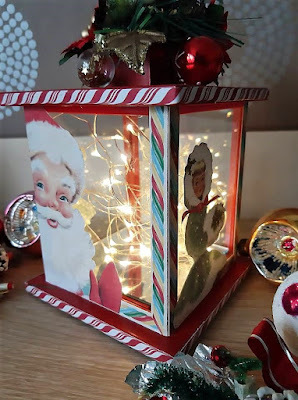 I also cut the red and white candy cane stripes that framed some of the Santa images on the sheet of Retro Christmas Cut aparts and used these to decorate the top plate and base plate edges of the lantern. 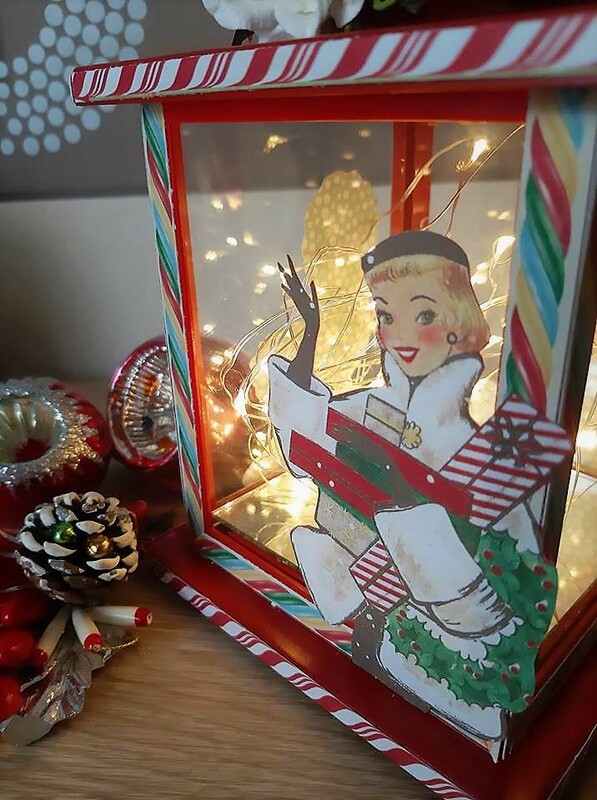 The lovely retro ladies also came from the sheet of cut aparts and I fussy cut one for each side and also the Father Christmas was from the same sheet. I trimmed a sprig from one of my long garlands I use to decorate our bannisters and wrapped it around the top of the lantern before adding a selection of Christmas flowers, berries, glittered ivy leaves and some miniature glass baubles to just finish it off. So... keep your eye out for some bargains....you can have all sorts of fun altering them. 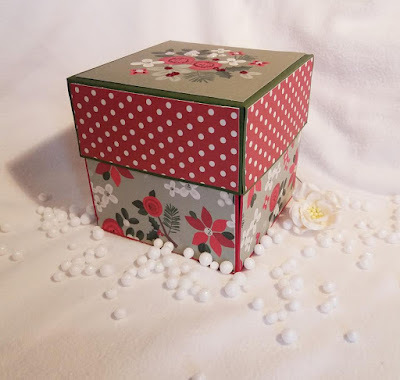 Christmas Cottage Explosion Box..... Simple Stories Merry & Bright. I am a bit behind with posting some of my DT work, so thought I would catch up and post this explosion box first. 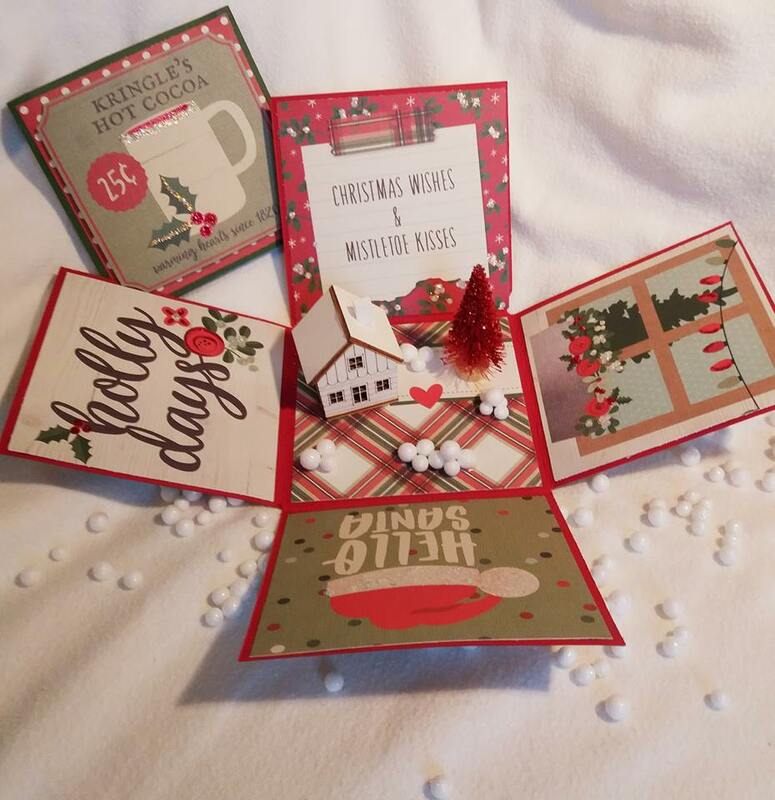 I really cannot believe how rapidly Christmas came round this year..... Do you make lots of your Christmas cards? I have to be honest and admit that I am rather naughty and only hand make some for a few of my friends, they are all crafty ladies and I know we all appreciate a handmade card... I have a couple of large boxes full that I have saved over the years of ones I have been lucky enough to receive and I love looking at them. 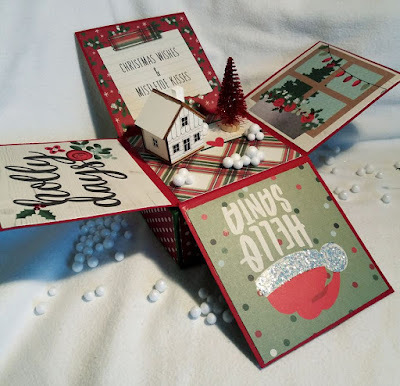 I wanted to make something different for some very special friends of mine this year and decided to make an explosion box and use as a card for them. 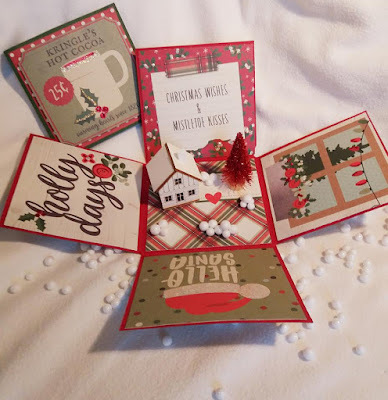 I have been working with the Merry and Bright Collection from Simple Stories, its a vibrant mix of red, green and white with a mix of plaid, polka dots and various other patterns and also lovely decorative panels to choose from. There are lots and lots of tutorials on Pinterest, You Tube and Google, to create various size and shaped Explosion boxes depending on what you want to do and so much inspiration for decorating etc. 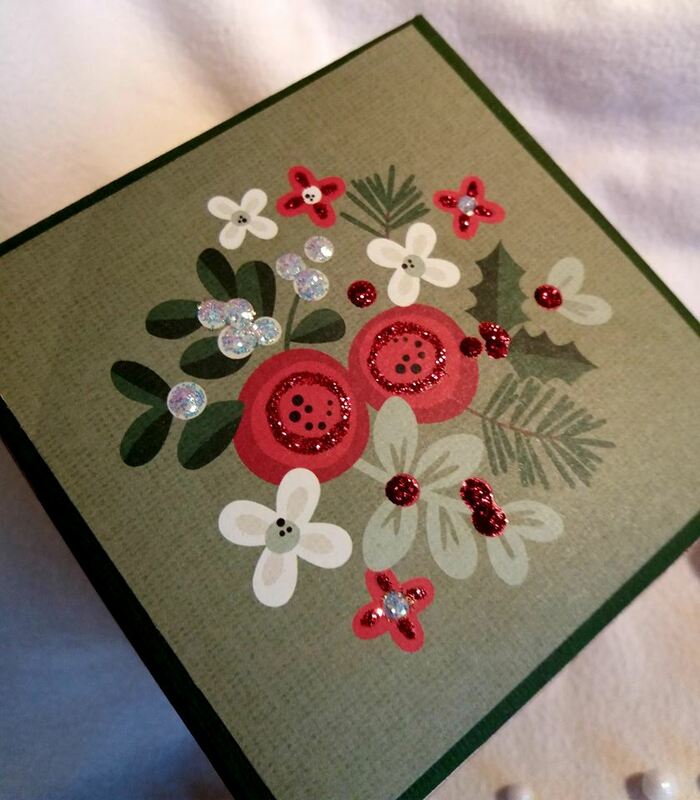 I went for a simple, single layer box based on a sheet of 12 x 12 cardstock. It was scored at every 4 inches, this meant the sheet was split evenly into 9 squares. I cut the top right and left panels out and the same on the bottom right and left. This left a basic cross shape and when the sides were folded up it creates the lower part of the box. 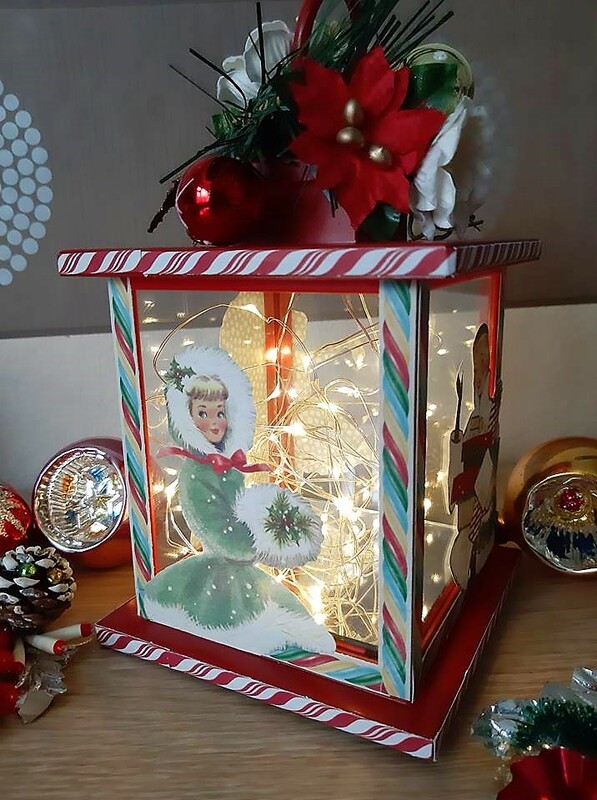 I picked 5 panels from the 4 x 4 Elements sheet and used them to decorate the inner base and each empty side ( you can of course use photos if you prefer) I also added some Stickles to pretty the panels up and give some extra festive sparkle! 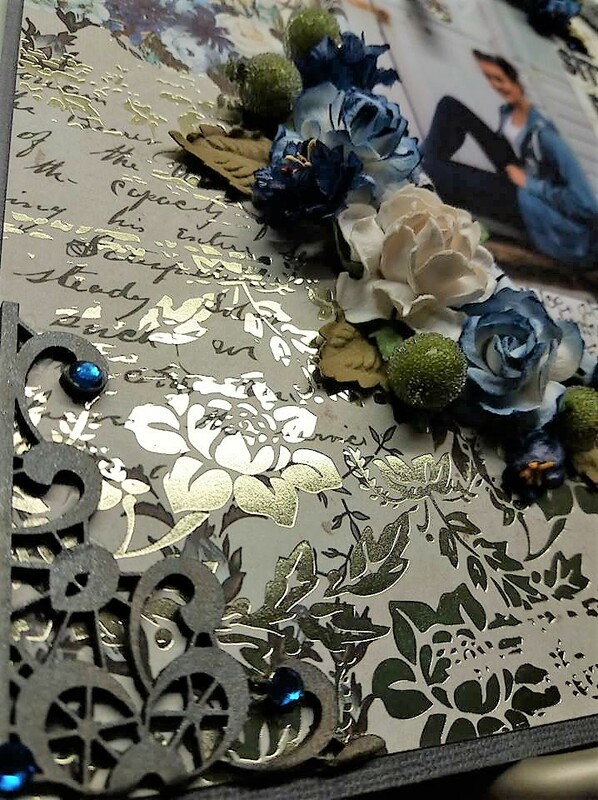 The outside of the box was decorated with panels of one side of the A Simple Wish sheet. I wanted to make a little 3d scene inside and found these sweet little wooden cottages and a mini bottle brush tree which were perfect for the job. Along with some teeny polystyrene snowballs to finish it all off. I used the 2nd sheet of card-stock for the lid. This was cut down to an 8 x 8 " square and then measured in at 1" 7/8 " along each corner, sliced inwards to 1" 7/8 and then folded to make the lid. This was covered with panels of the reverse side of A Simple Wish and the very top of the lid had a 4 x 4 Element Panel added to it and Stickles added. 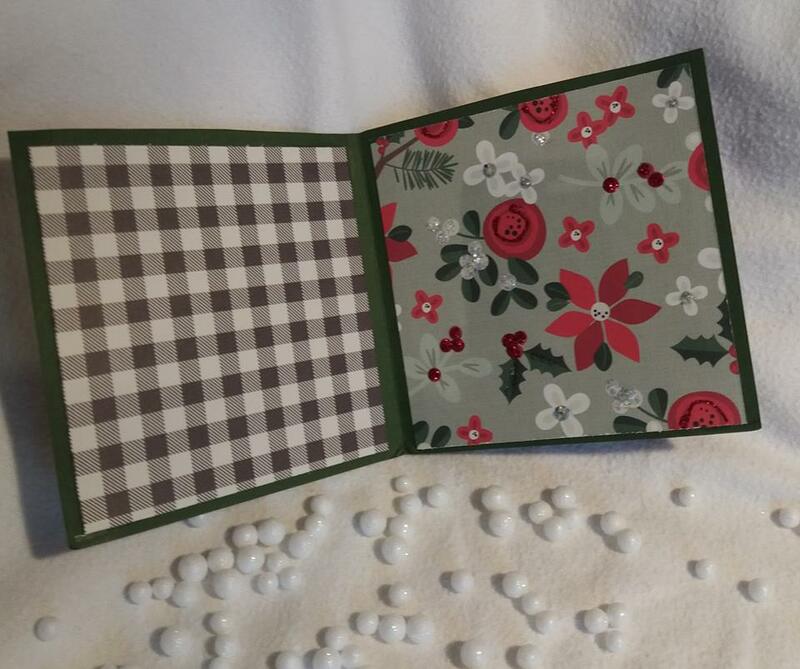 With the left over card stock I made a simple little mini album for some special photos to be added into. These little boxes are lovely to make and are great for many different occasions.... why not pop onto Pinterest, Google etc and see what ones you can find! Hopefully my friends will be pleased with it! Thank you so much for looking at my project today, I hope that maybe you are a little bit inspired to have a try yourself. 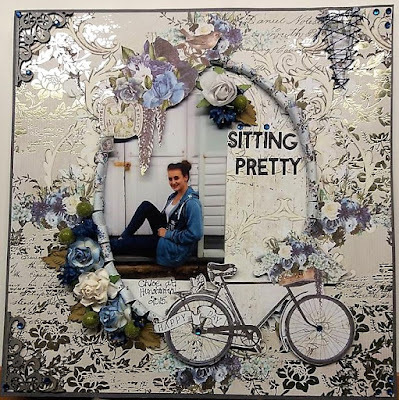 I would like to introduce the stunning GEORGIA BLUES Collection from Prima. 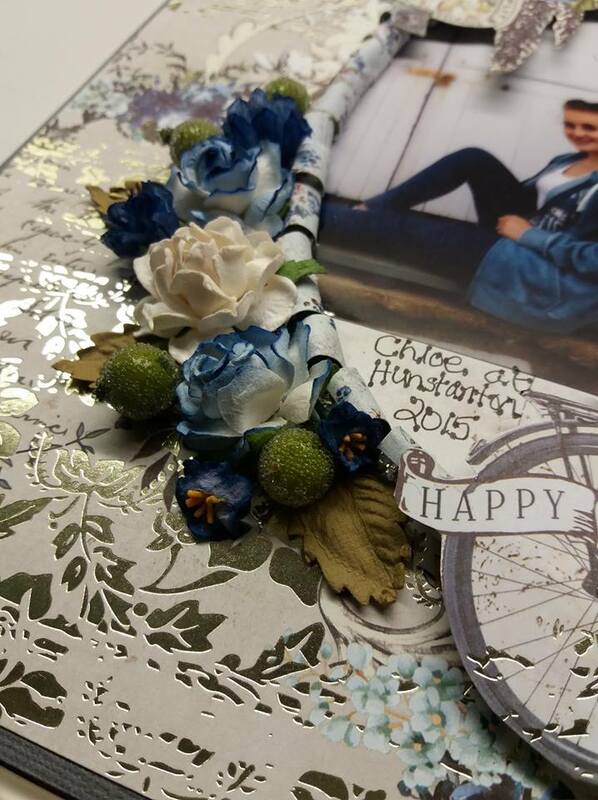 What an absolute delight these papers are with the gorgeous blue tones, floral displays and elegant silver foiling details on each sheet. The patterns are magnificent and varied and they really are rather luxurious. I have been wanting to scrap this photo, taken of our youngest daughter for some time. When we were on a day out on holiday in August 2015 we found a row of lovely beach huts at Hunstanton and we had a little photo shoot.... I think these papers were perfect for the job. I based the layout on a sheet of Dark Grey cardstock and took a sheet of MORNING GLORY that I then gutted out a large oval shape from the centre of the sheet. I cut small snips all the way round the oval and then using a thin paint brush handle, I rolled the edges backwards..... this created a rolled frame and also exposed the pattern from the rear of the sheet. I also used a sheet of HAPPY DAYS, from this I cut out the bicycle and the floral arrangement from the top left of the sheet. The large remaining piece was placed behind the oval aperture for the photo to sit on. 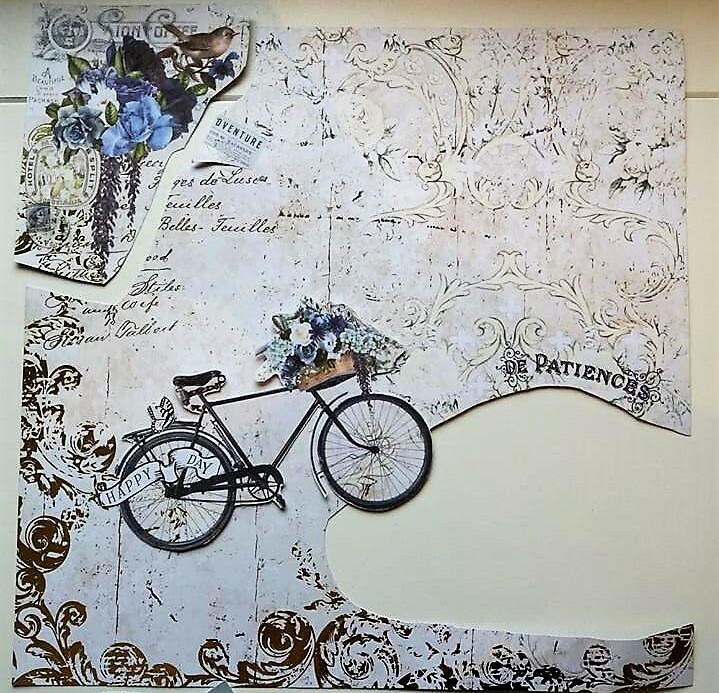 I added the bicycle and the floral section around the rolled frame and then cut a slice and rolled back on the top of the right hand side of the layout. Behind the slice I slipped in a small panel cut from a sheet of Memory Lane and then did some criss cross lacing using some sparkly blue thread. 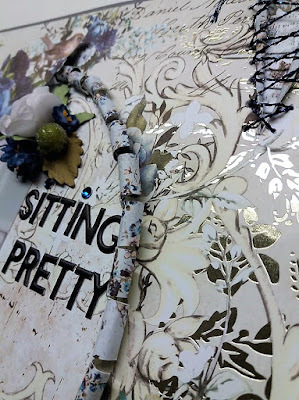 I took the Decorative Chipboard and cut it in half ( to use at the top and bottom of the page) I gently added some Pewter cream rub on to make it suit the page a little better. The title was made using some lovely puffy alphabet stickers from PinkFresh Studio and their Simple and Sweet Range and I then just added a few blossoms, berries and leaves and also a few blue crystal gems to finish. This really is such a beautiful, useable collection and I am very much looking forward to doing more with the remainder of my DT kit. Why not pop over to the SHOP and see what other gorgeous goodies are on offer. Today I have been using up the last few little bits of left overs from the sheets of Gypsy Rose that I have been working on. Please see my original post, Be Yourself , for the first layout using these gorgeous papers from Kaisercraft. 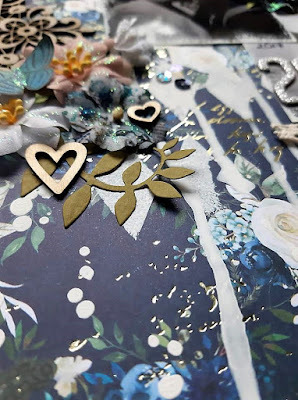 I am not normally a fan of using too much cardstock, but I had a couple of sheets spare and they worked well with the colours in this paper range. I cut the lighter sheet down to an 11" x 11" square and then using a Martha Stewart Deep Edge, I did a single punch on each side. I had a few floral clusters left over that I had cut out from the sheet of Inspiring and scattered these around the page. 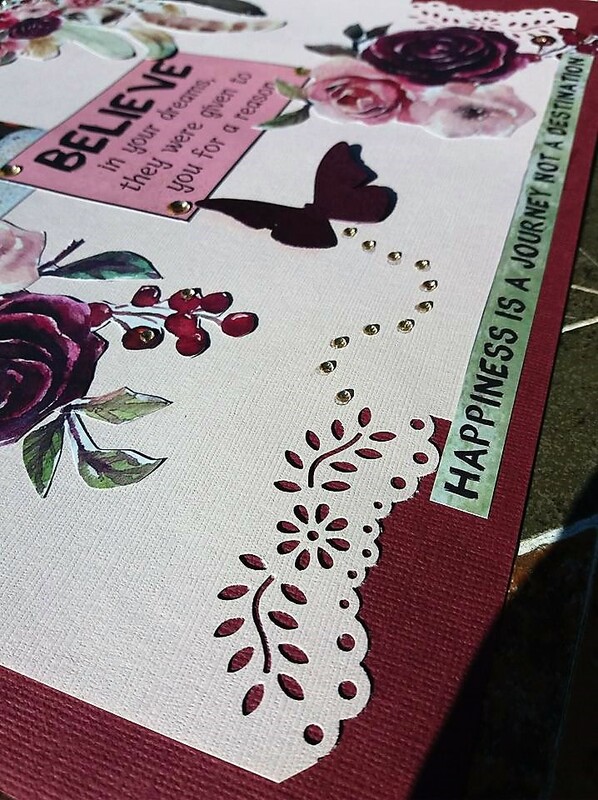 I also added a die cut butterfly and gave her a trail of champagne coloured crystals. 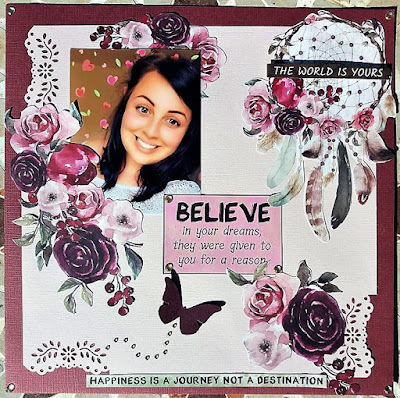 I chose a couple of sections from the sheet called Original....this is full of lovely quotes and sayings and is very usable for a variety of style layouts and cards. 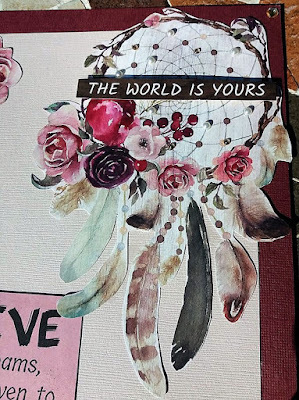 I also used the largest of all the Dream Catcher images in this collection, its taken from the sheet called Free Spirit. A little strip of words was added across the centre and I then added small and large Champagne crystals across the page in various places to finish the layout. 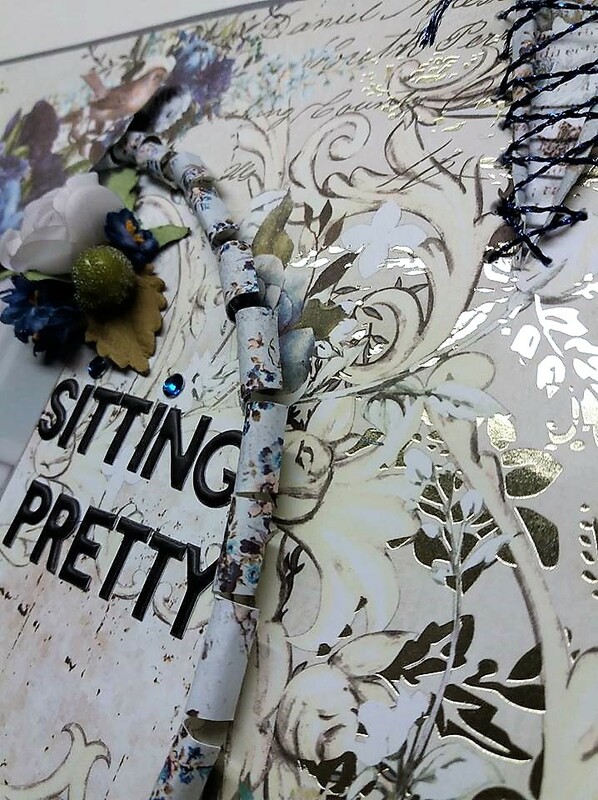 This really has been a delightful Collection to work with....and you can find Gypsy Rose and lots of other stunning Kaisercraft Collections here at the shop!